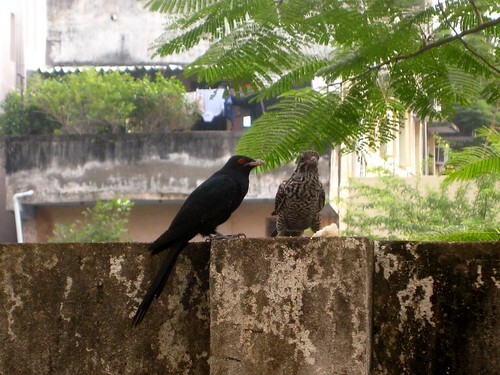 I captured the Koels in front of my house while the couple feeding on the grains I left for birds on the compound wall. The birds were often sighted near my house... and hiding away in the bushes used to call aloud among the many twittering birds. Renowned for their sweetest tone, Koel has inspired many poets to pen down; numerous songs and poems enhanced the bird enrich in calls that are distinctively loud, despite being black or gray in color. Echoic in several variant languages, Koel is hardly distinguished from crows on their first sight except peek into its crimson iris is apparently different between male and female – which has white and buff spot on its brown back and represents the hawk in appearance. 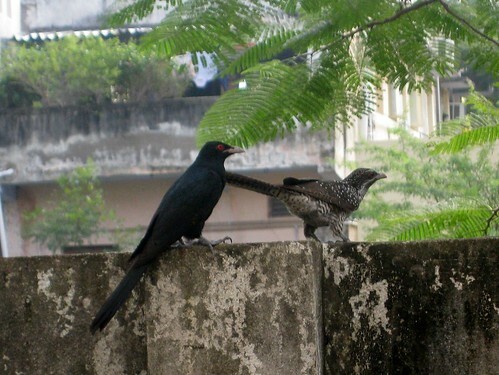 Koel’s were ever like lazy and brood parasite to only lay eggs on crows or host nest. 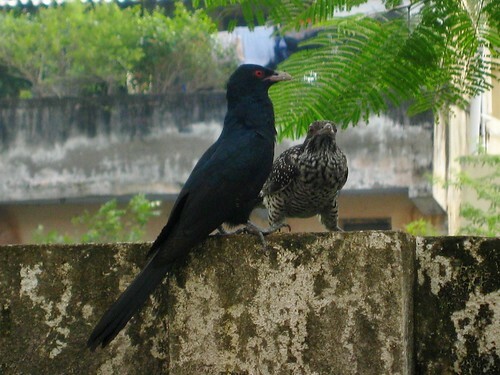 Once Very popular in India as cage birds, Koel feeds even on boiled rice; is the state bird of south Indian state Pondicherry. It’s a second incident within a week where disabled persons handled harshly by the airlines and pilot in India. First it was Jeeja Ghost; a 42 year old Cerebral Palsy was offloaded from a Spice Jet flight since the pilot felt she’s unfit to fly and now Anjlee Agarwal suffering from Muscular Dystrophy is forced to sign an indemnity bond to fly. Both the women are not just disabled folded inside four walls; each work for a source towards society and achievers themselves with their inner ability and successful at work against the war disability. Jeeja Ghosh is a teacher at Indian Institute of Cerebral Palsy and as a student did her postgraduate in UK, staying along and traveling overseas many times to never suffer like this before. In the case of Agarwal it’s not just sign an indemnity bond but the worst came as denying aisle chair to de-board, was insisted by the supervisor to take bodily lifted by four male loaders claiming that Raipur airport doesn’t have aisle chairs. What a disgust and ill-treated by the supervisor who threatened her to agree bodily lifted or will be sent back to Delhi where she boarded. Ms. Agarwal is an executive director and asses consultant with Samarthyam, National Centre for Accessible Environments. After fight for 35 minutes accusing her of not requesting a wheel chair while booking tickets which she denied completely and thus realizing that Agarwal is not ready to give up, a Jet Airways aisle chair is brought to de-board her literally. What a disgrace indeed denying the differently able, instead assisting and make sure they are comfort… it quite reveals the mindset of some never grown to understand how to treat others with self-respect and having a heart for those travel on their reliance. De-boarding once on-board is an insult no one can digest easily and bodily lifting a woman by four male is an abuse unless the women agrees… This should never left to free to follow again and a punishment or compensation is needed to avoid further disappointment bore to travelers alike(differently able). 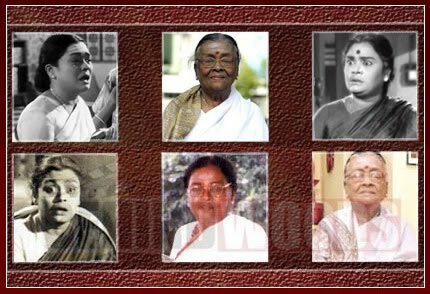 She has passed away now but her role has been extreme and she is one of the long stood actors in Tamil cinema and even few days for her last breath she has been shooting for television serials. I wonder every time seeing her on screen, thinking how old she may be to go still mighty from playing mom to grandmother roles for many leading actors and even not more signifying roles to lead me gaze. S.N. Lakshmi, the most dotted actor for her comedy roles and animated on the color generation front contributed 70 years of life on entertainment and art, left orphan the industry in her age of 84. The veteran actor began her career as a theater artist when she was 13, had stint to successful of encompassing 6,000 plays on stage and nearly 1500 films on silver screen. What more we say, it’s impossible to replace her role by another and I doubt will this generation actors withstand in her part and brave enough to fight with a tiger in 'Baghdad Thirudan' has wondered many to still rethink. The mild smiling face and sacred ash smeared forehead will always remind her for foremost despite her strong mother bond roles of colorless classics and devoting herself to acting to live alone her life filled with dreams of devotion and serve humanity. Hope she rest to peace at her native place as per her wish! Wrote this afternoon while listening to twittering birds and thinking aback where future lies. I think there's nothing to create wonder than giving back what we take from here. Every development and technology is build for us not to destroy our sources and relationships, but easer our everyday life and bring equal opportunity to everyone to experience the life and resource spread everywhere. 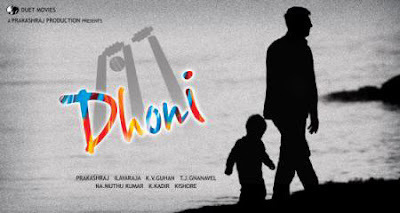 The actor turn-producer Prakash Raj’s directorial debut Dhoni is not alone a movie, but a message for the entire education system that everyone needs to read, understand and help bringing change in future. This is not first time Prakesh Raj impresses with his acting, but taking away the entire script in his hand had moved emotionally to the core unlike ever to leave wet eyes and heart weighted. He’s one of the finest versatile actors in India whom I like and admire the most, and he has a thirst-quenching for innovative and different movies that an entire family could enjoy. Now as a director has tasted the delicious fruit of the film industry that too taking away a social cause in hand had handled well both the direction and acting at same delight. However he shines on screen as a light on night and shadow at sunshine. Dhoni, domains the middle-class life and explains their most expectation, the education which they believe and certainly the only source they could save for their children’s future. Karthik as Subu’s son is passionate on cricket and wants to become a player like Dhoni, was forced by his father to concentrate on studies which he’s not interested and unable to memorize a thing brought conflict into them that put crisis to push back at rear. Akash as Karthik is best choice for the role of 14-years old and he himself in the age of group, acting comes casually to him and expressions where so real… and Radhika Apte as a neighbor is refreshing and smiles so cute as a smart prostitute or keep in decent role. The emotional scene in the backdrop of my favorite talk show Neeya Naana is tough and significant phase to go through deep. The most attractive part of the movie is the music! Ilaiyaraaja’s composition was quite awesome and bliss esp. the songs and lyrics were rather obvious and meaningful to listen. Again hats off to Prakash Raj for his indeed contribution to the concept of bringing change into the education system has hit hard those critics students so far for their week performance in studies. Education is to improve our knowledge and not in an intention of money making or fame alone and we need an education that gives special attention to students who are unable to cope up with studies in due care and affection and not hurting them deep. In other hands both parents and teachers need to act as a balance in understanding the child’s ability and mental strength to encourage and develop in what they are interested, and not everyone has an intention like becoming Dhoni, but has some talent hideaway from the common cause education that we only know about. Dhoni – An all rounder (Prakesh Raj) wins the man of the match and receives great applauds from audience aside! 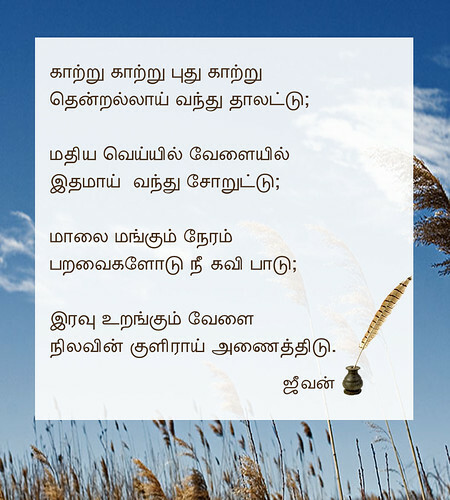 When thinking what to do for this yet another special day, this poem comes to the mind which I wrote sometime before in Tamil and then translated it to English. I want to make it something different and got this sticky notes idea and went on composing... except stealing the pen from internet. Children are used to compare with divines who mean to be pure, innocent, harmless, and genuine... but few incidents happening in society quite rear at shock and something exists at western schools is at last here. Two days ago a 15 years-old student killed his school teacher fiercely with a knife within the class in Chennai has shook everyone at nook and corners of the city and country. What the kid done is obviously condemnable and unforgivable, but consciously he’s not quite culprit and what disgusted him to take the knife is need to be revealed… obviously and rather himself admitted why he was ferocious on the teacher who made remarks on his report card and threatened to fail him. We all know it’s a common thing all teachers do to make student learn better and score good marks, but sometimes students who can’t come out of emotions end up with negative thoughts of one killing themselves or seldom dare to attempt on others. I’m not appreciating his boldness and its quite contempt that no one should ever be stimulated by such daring thought and its astonishing how his little mind captured such cruel to kill someone. Once there used to be classes on moral science where they teach us valuable lessons on life and personal development and realization are indeed missing now, and instead computer science and mark oriented subjects took prior to keep away the taught on goodness and behavior. Once there were great respect and equal fear were kept on teachers, and children who doesn’t obey to parents will be obedient to teachers and not that they are different now, but children are growing fast unsteadily expose to television, internet and movies are rather to any kind of activities and behavior. Parents too are forcing their children to get more marks and rank, and comparison is the worst tool they always take in hand to measure their child with other children and however their behavior are want them to place in higher order. I’m no more to say education has become business and parents want their children to be an investment to gain profit later. Media’s influence is a lot these days on children, where they remember the rhymes are not well like memorizing the film songs… I hear from my neighboring kids while they play sing the infamous Kolaveri Di (killer rage) and Evan Di Unna Pethan... Kaila Kadaicha Sethan (Who’s your father... will be killed if caught in hand) kind of rubbish songs with killer rage lyrics has captured their attention a lot and thus applied by the kid today on his respected teacher. In the kind of knowledge, learning, playful, disobedient and worst behaviors are rising even on children and double the latter generation needs a proper guidance by teachers as well as parents to negotiate their difficulties, disagreement and emotions. Foremost the kids are unlike before, and they have a tendency to learn and earn soon has lack of behavior and irresponsible towards elders as they think know everything but incompletely... and not all kids are under this category. 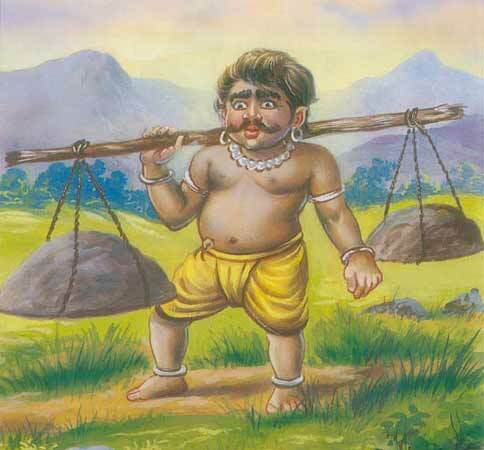 Palani – the birth place of Kavadi! 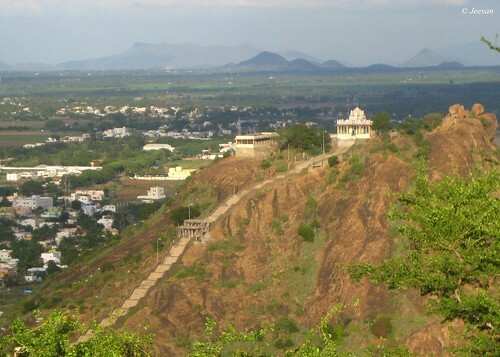 Palani is the third home among the six homes of Tamil God Murugan and it is located near the Western Ghats of Palani range in the Dindigul district of Tamil Nadu. The legend says that Murugan the son of Lord Shiva and Parvathi, got anger and came to this hillock to stay like a beggar by just wearing a loincloth when he couldn’t get the Gnanapalam (wisdom fruit) brought by Narathar. Palani is the name of the hill here and it has another reason to call it as in mythology that Shiva and Parvathi called Murugan as Gnanapalam Ni (you’re a fruit of wisdom) in mollifying him, thus the ‘palam ni’ later transferred into Palani. 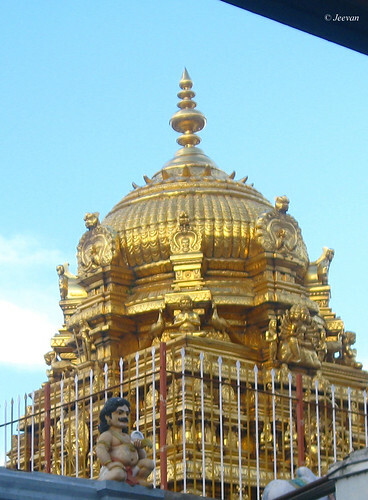 The deity of Murugan inside the sanctum sanctorum is made of an amalgam of nine minerals called Navapashanam, so whatever the anointment done on ideal is believed to get the ability to cure all disease. The temple on the hillock can be reached by the main staircase or the elephant path on their convenience and who can’t climb up can take the winch track or Cable car. Thai-Poosam is a very important festival celebrated here much enthusiastically yearly on the Tamil moth of Thai between the 15th of January-February and on this occasion devotees take Kavadi – physical borne to their shoulders and dance in zeal. Traditionally, the most honored of the pilgrims whose arrival is awaited with anticipation by all are the people from Karaikudi, who bring the diamond-encrusted Vel or Javelin with them. The pilgrimage taken by many from distant towns and villages are strictly vow to abstinence and come barefooted by walk and the tonsuring is the chief traditions followed by devotees to this temple. 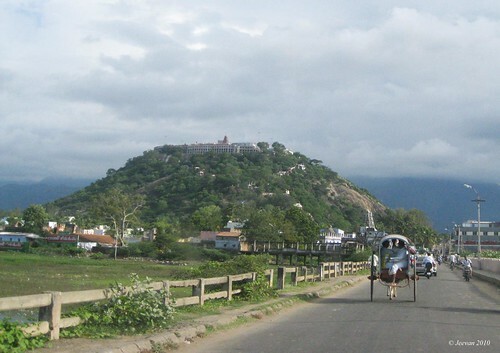 Adjacent to the Palani hill is the Idumban malai. On the commission of Sage Agasta, the Idumban his demon disciple bore two hills of Shaktigiri and Sivagiri on his shoulder to his adobe and on the way he placed the hills aside at Palani to take rest couldn’t remove it when resumed his journey. Upon the hilltop, Idumban met a boy who prevents his proceeding began to fight fiercely, slain Idumban which ensued that he later restored to life. 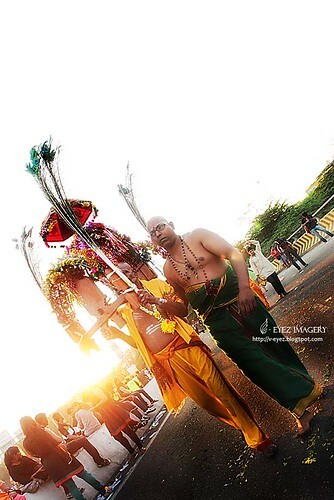 Idumban who belatedly recognized the boy was his favorite deity Murugan and he wished to him that whosoever carried the kavadi on his shoulders signifies the two hills and vow to take blessing privilege by standing sentinel at the entrance of the hill. The custom of borne the kavadi on their shoulders has spread from Palani to all Murugan shrines and Idumban is the first Kavadi bearer. Palani is also renowned for the delicious Panjamirtham, which means a mixture of nutrient ingredients like milk, fruits, dates, honey and jiggery and banana is the chief ingredient of this ambrosia. Palani is connected by roads and can be reached from anywhere via Dindugal or Coimbatore both are a major cities at a distance about 60kms with nearest railways stations and Coimbatore holding the airport. I visited Palani in late 2010 and the pictures in the middle are captured by my mom from the hilltop, and the last photo is from by friend Visithra on Malaysian Thaipusam. Thank you for allowing me to use your photo Visith. someone plucked to drop here. It seems the cold likes me so much to caught often. This time something unbearable but still doing better with intense cough and blocked nose. 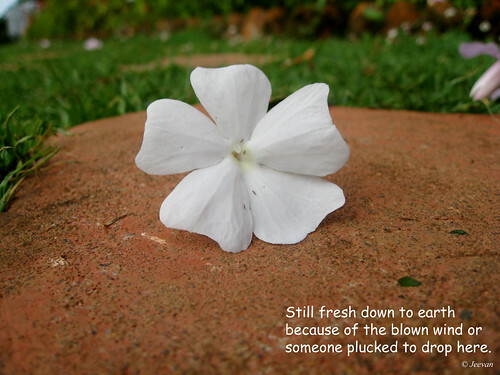 Today is my parent’s 28th wedding anniversary and I dedicate this post to them and this photo was taken at Kotagiri and I went with a haiku poem on it, for a Friday flower post.